Self-determination theory (SDT) is one of the most powerful frameworks to understand how human flourishing can develop. Here is a very brief recap of what it is*. SDT assumes two things about human beings: 1) that they are naturally active and growth-oriented, and 2) that they have a tendency toward psychological integration. This second process means that, as people encounter new experiences, they are challenged to integrate them with existing aspects of themselves. This process of integration leads individuals to develop increasingly complex self-structures in which values and regulatory processes from outside are internalized. SDT has identified three universal psychological needs: the needs for competence, autonomy and relatedness. The satisfaction of each of these needs is essential for psychological well-being. Whether these basic needs are satisfied or not depends critically on whether the relationships and environments people are in supports or frustrates this process. A relationship or environment which is autonomy-supportive will support need satisfaction which will lead to psychological well-being. A relationship or environment which exercises psychological control will thwart need satisfaction and will lead to psychological distress**. The power of autonomy support is relevant for different types of relationships and environments such as parent-child relationships, peer relationships and romantic relationships, and relationships and environments at work. 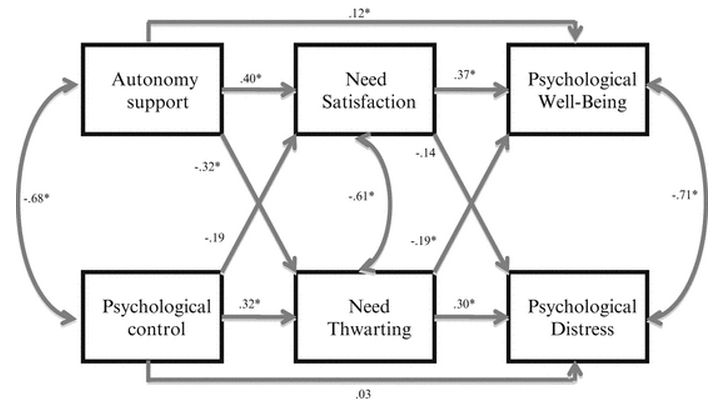 A great example of how this theory is relevant for work life is shown by Dagenais et al. (2014). In two figures they show the differential impact of autonomy support practices and control based practices. Figure 1 (below) shows, in the first column, examples of autonomy-supportive practices. 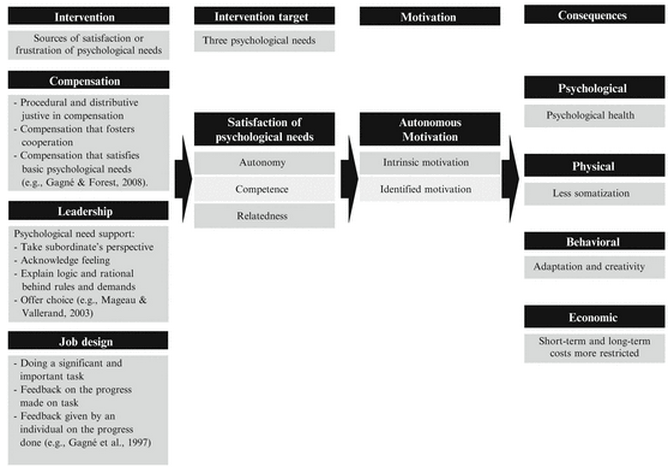 These practices support the satisfaction of the basic needs (column 2) which gives a perception of autonomous functioning (column 3) in which both the process of integration and intrinsic motivation are supported, which leads to psychological wellness (column 4). Figure 2 (below) shows, in the first column, examples of controlling, autonomy-thwarting practices. These practices frustrate the satisfaction of the basic needs (column 2) which gives a perception of controlled motivation (column 3) which leads to several psychological and behavioral problems (column 4). For more details, see Human Motivation and Interpersonal Relationships (chapter 12). 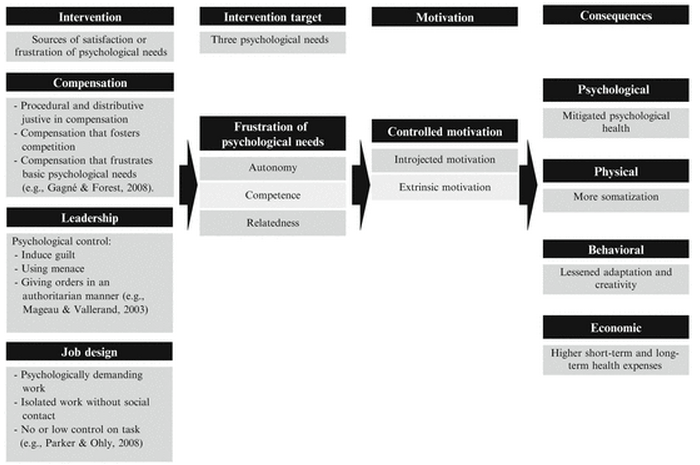 Questions: which of the autonomy-supportive interventions could you start to use more in your work? Which of the controlling interventions could you start to let go of? ** this is illustrated in the picture at the top right of the post. This picture shows the results of a path analysis in a study with 279 Canadian workers form the paramedical sector (Dagenais et al., 2014).